November 2015: Discovered Castelli gear! With each evolutionary step, I have learnt so much. Not only has my working knowledge of bikes dramatically increased (from knowing virtually nothing! ), but my confidence on the road has also come in leaps and bounds. I remember when I first went out on the road, I was petrified! In all honesty, I am still very cautious of motorists, but have gained the confidence to ride safely and do the best I can to protect myself from harm. I can actually recall that I could not even operate the shifters on my Orbea back last summer(!) and my good friend Julian Porter really helped me (patiently) during this time, for which I am grateful. He is actually still my cycling mentor, and saviour, in many ways to this day. 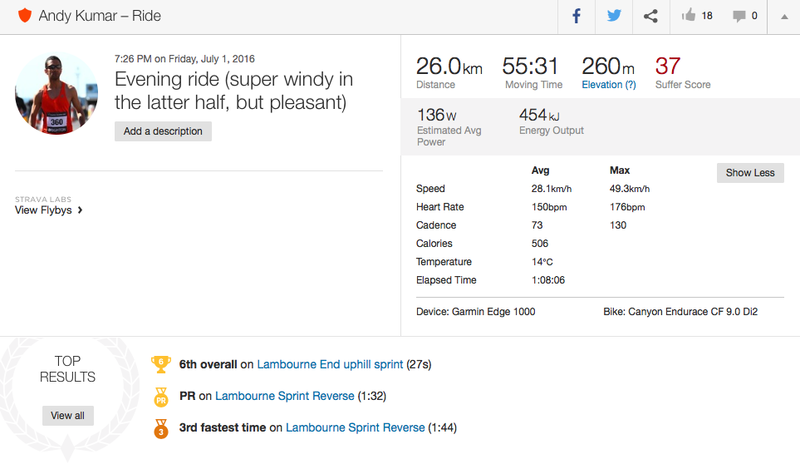 Here is a nice comparative analysis between my first ride, and what a typical ride is like now. This is actually a very personal blog post, but hopefully it can help my friends who are getting into road cycling for the first time to see how quickly knowledge is gained and transitions come. Road cycling has completely changed my outlook as an athlete, and as much as I love running, will never look back at myself as only a runner. Roll on September for the L’Etape where I have signed up for a 92 mile ride with my friends Mark and Dan. Time to finally net that century ride!